It has become an annual tradition for Germany to host its own Eurovision show in the run-up to the contest, with panelists ranking this year’s entries. Back on Friday, Cyprus topped the first songcheck. Tonight, Spain‘s Miki came out on top. The songcheck has taken place every year since Lena’s triumph with “Satellite” at the 2010 contest. Hosted by Alina Stiegler and Stefan Spiegel, the hosts discuss the entries with a panel of experts, and also bring in comments from readers and viewers. The 2018 programme sees some familiar faces as show guests. Germany’s commentator Peter Urban, radio host Thomas Mohr, Jan Feddersen, “Dr. Eurovision” Irving Wolther, Marcel Stober, Constantin “Consi” Zöller, singer and actor Isabel Varell, moderator and DJ Larissa Rieß, actress Kathrin Ingendoh, YouTuber Freshtorge and members of the Olivia Jones family join the two hosts. Besides, our very own William Lee Adams and Deban Aderimi are once again part of the programme, too. A new feature of this year’s songcheck programme is the addition of a fan expert. Back in March, Paul Klur from Dortmund won the voting on their website and thus joins the other guests. In what’s considered the closest race for the top spot in the programme’s history, Spain’s Miki came out on top. He’s ahead with a score of 7.8, followed closely by Greece (7.4) and the Czech Republic (6.6). Host country Israel comes in a bit lower with a score of 4.9. What do you think about the results of the second songcheck? Did X deserve to top the scoreboard? Comment down below! Alina‘s taste is the pits. She hated Elina Nechayeva‘s La Forza and now Zero Gravity and songs like Telemoveis. It can‘t get any more basic than that. LOL! One day and you still haven’t managed to write the true audience scores for Greece (7,8) and Spain (7,4) ?! What is your problem? But the “experts” aren’t experts and they don’t rate the songs, so I don’t know what your problem is? I enjoy the songchecks because I really like the hosts Alina and Stefan. They give rational scores, are respectful and they kinda know what they’re doing. Of course the “experts” have no clue and are annoying, but they’re just there for entertainment purposes and have no influence on the score. It’s simply my opinion on the “experts”, but yeah, I see your point and I understand it! If Spain gets the stage right for once, this could be an easy top 10. This kind of party, happy songs are perfect for the live show. Fokas Evangelinos will create Spain staging. He can do no wrong (Ani Lorak, Farid Mammadov, Sergey Lazarev, Doredos and many others). You forgot Helena Paparizou who won, but recently he had a lot of failures such as Demy in 2017 and Azerbaijan 2018 who didn’t qualify. So not sure if he’ll bring a good staging this year (he does Russia too). Spain??? Is my number 41. I can’t hear anything likeable in that ‘song’. I do welcome Portugual to the ESC but I am happy Portugal didn’t have to drop out. Peace peace love love & all that J! Greece is Annie Lennox copy-paste. I never cared to say this before, but when I see people being bullied for not liking Greece I must speak my mind. Don’t expect everybody to like Better Love. I identify it with Florence+Machine. Switch out Hungary for San Marino and I’m on board. San Marino was a mess at Eurovision in Concert. Not a fan of the song anymore. Dropped to number 33. This article is cringey in general. Not only the results are awful (Poland over San marino, no qualification for Serbia but yes for Czechia), but they are also f*cking wrong. And nobody cares to correct them. I’d honestly prefer the Czech Republic to qualify over Serbia. And much as I love San Marino, I’d probably rank Poland higher. I am from Spain ,Germany thanks a lot….but, I think that Spain is not better than Greece first of all and I have a questions, allways voting the same people for the all parts of the voting? I mean the same people that have vote the first program have vote at the second part too? The audience vote would at least be different? Good to see the German audience appreciate the Spanish entry. It’s clearly very uplifting and I hope this positive energy translates into votes too. Miki is a great performer, so good luck! I actually like those ten qualifiers to be honest, kinda similar to mine. But obviously not the same order. Poland and Australia won’t qualify, Estonia and San Marino will! How will Estonia qualify being sandwiched between Portugal and Iceland honestly? Poland maybe, but Australia will qualify for sure. San Marino is kind of a fanwank, Estonia is out. Just a small typo, it’s Portugal, not Portgual. I could live with Top 10 qualifying. The show has the same score for both. Yes, but they even said in the show that “Miki won by 0.05 points”, they just don’t write the precise scores down afterwards. Unexpected victory. Hope this later translates into some points in the Grand Final. I watched the whole thing while typing up a document to prepare for exams and guess which song I had stuck in my head afterwards. It absolutely needs to qualify. I agree with Cyprus at number one and Georgia and Montenegro in the bottom. But I would’ve put Slovenia lower and Serbia higher. Then Good job to Spain ! @wiwibloggs There’s a mistake in your article: Greece got a 7.8 from the audience and Spain got a 7.4, the whole scores of these two are mixed up. Thanks for the correction, Weissbrot. Still, I remain shocked! Lol, Florian I’m sorry, but it’s still wrong. 😀 Greece got 7.8 from the audience, Spain got 7.4. So please change the article. I mean… Miki only won this one because Alina gave a 10… She also gave a 3 to Iceland and I’m like “Really”? But overall I’m okay with the scores. I expected even a far worse score for Portugal lmao. Kind of relieved. Greece won the audience vote, that’s what really counts. i am confused what is the score tha Greece and Spain received from the audience? Greece 7.8, Spain 7.4… They mixed it up in the article. That girl’s taste is real basic for me. Really?Do they mean that Czech Republic-Slovenia-Cyprus and Spain have all better song than Greece?Hahah No way! No more comments! 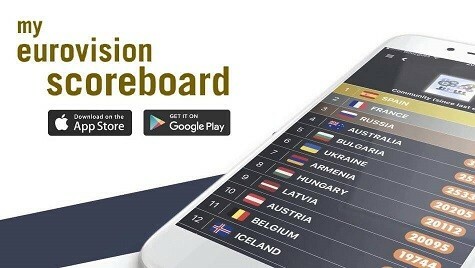 Spain, Czech Republic and Slovenia get a better score than Greece?!?! What you have to pay attention to is the public score (the people who voted at home). Greece got a 7.8, the highest one so far. Spain got a 7.4, Greece got a 7.8. The post on wiwibloggs is wrong, I watched the whole thing live. So true,no taste at all!I agree with you!